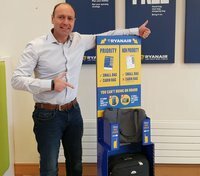 Ryanair put into force a new carry-on bag policy as of January 15, 2018. It is linked to the so-called priority boarding. The carrier introduced priority boarding in 2006 as a new instrument to nickel-and-dime customers, who had to pay €3 to be among the first to board Ryanair flights. Meanwhile, this fee has been doubled to €6. When you visit their website you can click to get an announcement about the new policy, but even there you will not see the €6 priority boarding fee. Only by searching the website further you can find it. But if you travel on Ryanair you can take it for granted that during the whole journey you need to have your credit card at hand. Passengers can now only take 1 small bag (35 cm x 20 cm x 20 cm) into the cabin. If it appears bigger at boarding you will be charged at the gate €50. 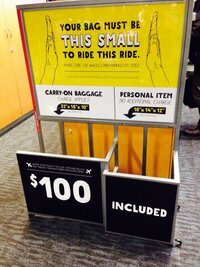 You can take a second small bag only if you have purchased priority boarding. Why would passengers like to board among the first? After all, they will be stuck longer in a seat that is too small and with their knees jammed into the back of the seat in front of them. The reason is, of course, that they put this inconvenience up with finding a place for their carry-on in an overhead bin. But for quite a few priority passengers there is a good chance they will not find any room for their bag. Ryanair will sell the priority perk for 110 seats out of the total of 189 available on its planes. Thus, if sufficient passengers are willing to pay the fee nearly 60% of passengers will be priority and just over 40% will be non-priority. Thus, the most exclusive passengers are those without priority. This implies that even if you have paid for priority boarding the plane may already be more than half full before you are boarding. As a consequence you may be unable to find space for your 2 bags in an overhead bin despite your “priority” status. Ryanair has uplifted nickel-and-diming to an art. Even for a standard seat you need to pay a €2 fee. The fares are, therefore, misleading because you have to sit somewhere, so there is no way to avoid the fee. Ryanair once considered to introduce a fee for use of a lavatory, but did not followed up so far. Low cost airlines are successful because many passengers only look at the base fare and do not calculate the total fare including all fees some of which cannot be avoided, like Ryanair’s standard seat fee. In response to a question from one of our readers some time ago we once calculated the fare difference between a low cost carrier and a traditional airline. It appeared to be negligible, while the trip on the low cost carrier not only went hand in hand with numerous fees, but also major inconveniences. Which airlines squeeze the most out of their customers?